The EUR/USD has failed to top 1.50 once again and the level is having as much psychological influence as we anticipated. 1.50 separates the EUR/USD from consolidation and exciting near-term gains. The currency pair has toppled the rest of our foreseeable near-term obstacles, leaving 1.50 as the final test for the bulls. Meanwhile, the Cable has approached 1.65 and is a close downtrend line away from making another run itself. Furthermore, the S&P futures are battling 1100 while crude stares down $80/bbl. Not to mention the USD/JPY is trading just around its highly psychological 90 level. Hence, we are clearly at a critical juncture in terms of the longevity of the present bull market. Technicals are pointing in favor of a continuation of the uptrend, while fundamentals are sending mixed signals. German and U.S. PPI data came in below analyst expectations, indicating the massive injections of liquidity have not triggered inflation yet. Therefore, the ECB, BoE, and the Fed have less incentive to drain their QE packages despite mounting political pressure. Trichet and the ECB reiterated their desire for a stronger Dollar, and are hoping the Fed will do its part to counter the Dollar’s demise. If not, the ECB may be inspired to take a more hawkish monetary stance in order to defend the interests of its critical manufacturing hub. Hence, psychological forces are beginning to work against the EUR/USD’s uptrend. However, the ECB is all talk for right now, and the EUR/USD may be allowed to head towards 1.55 before the central bank is inclined to take more definitive action. Meanwhile, Q3 earnings are printing better than expected, confirming the belief that the global economy is stabilizing. The EU will be quiet on the data-front until Thursday’s Current Account Balance release. The EU’s Current Account turned positive last month for the first time since April 2008. Investors will be looking for another optimistic release of 4.3 Billion. However, the more important EU releases will be the Friday’s wave of PMI data. For the time being, investors will be paying particularly close attention to BoE Governor King’s public address this afternoon along with and important set of China econ data Wednesday night EST. China’s upcoming data releases could be the make or break in regards to the continuation of the EUR/USD’s uptrend. Positive China econ data would likely further encourage investors to put their money into higher risk trades such as the EUR/USD and AUD/USD. Since we are expecting China to outperform, the EUR/USD may very well experience another leg up barring any hawkish commentary from the ECB. Technically speaking, recent behavior of the EUR/USD and its correlations is more supportive of further movements to the topside than the downside. However, tides can change quickly, so investors should be on their toes since we are at a critical juncture across the board. The EUR/USD’s current topside obstacles are the psychological 1.50 level and our three downtrend lines. As for the downside, the currency pair has multiple uptrend lines serving as technical cushions along with 10/19 and 10/13 lows. The Cable is climbing towards our important 3rd tier downtrend line and the psychological 1.65 level after earnings from U.S. bellweathers surpassed analyst expectations. The combination of impressive earnings and recent positive GBP data has given investors enough incentive to continue the Cable’s amazing run. The currency pair is now facing our important 3rd downtrend line which we highlighted in our previous commentary. Our 3rd tier runs through September highs, meaning its demise could signal another bull run for the Pound. Additionally, our new 4th tier downtrend line isn’t too far above. The 4th tier runs through August highs, showing the Cable is ultimately knocking on the door of a potential run towards the psychological 1.70 level. Despite the Cable’s present strength, we’ve seen runs like this before only top out just below their critical downside technicals, only to revert to their previous trend. Hence, we are reserving our optimism until the GBP/USD can break through these aforementioned technical walls. Regardless of topside barriers, the Cable has quickly established quite a few technical cushions during its present run, beginning with our 2nd-4th uptrend lines and 10/19 lows. It is a bit ironic that BoE Governor King will be addressing the general public this afternoon EST. We’re certain King is fully aware of the important near-term technical position of the Cable at present. As we’ve seen before, King is not afraid to play psychological games with investors to influence the near-term value of the Pound. Hence, we would not be surprised to see Governor King attempt to subdue investors by quelling hopes of a reversal from his notoriously dovish monetary stance. Therefore, King may be a bit aggressive during his public address, meaning investors should be wary of higher volatility. Disappointing PPI data from both the U.S. and Germany today could further motivate for King to stick to his guns. Another incentive to keep psychology contained is the wave of economic data flowing from China late Wednesday EST. We suspect China will top forecasts once again, providing further motivation for investors to head for the riskier investment vehicles. Therefore, King has more than enough reasons to keep the Cable bulls in check. After all, British data has only recently turned positive, and the BoE likely wants more confirmation concerning the recovery in the nation’s service sector and unemployment. On the other hand, now would be an opportune time for the BoE to support the idea of a stronger monetary policy, so we will have to see how the news pans out. Meanwhile, investors should keep a close eye on the interaction of the Cable with our 3rd and 4th tier downtrend lines along with the psychological 1.65 level. The GBP/USD is on the cusp of a more substantial breakout, and it will likely be up to Governor King whether to play ball or not. The USD/JPY is bouncing after touching the psychological 90 level and what is now our 2nd tier uptrend line. The USD/JPY has been under selling pressure since topping at our 1st tier downtrend line. The BoJ’s minutes revealed the central bank is encouraged by recent performance of the Japanese economy, and is less inclined to add more liquidity to the monetary system. In fact, the BoJ all but reaffirmed its new hawkish stance towards the Yen with the DPJ looking to install a more conservative fiscal policy supportive of a stronger currency. The BoJ’s minutes helped temper the USD/JPY’s present run despite another solid performance from the S&P futures. Impressive Q3 earnings indicate the global economic recovery is coming along nicely, encouraging the BoJ that U.S. unemployment will decline and consumption increase. Therefore, the central bank may believe it is unwise to act now since an increase in U.S. consumption would likely weaken the Yen and help the USD/JPY stabilize naturally. However, the USD/JPY is still under a considerable amount of long-term downward pressure. The USD/JPY presently faces multiple downtrend lines while the currency pair continues to have trouble leaving the psychological 90 level behind. In addition to the downtrend lines, the USD/JPY also needs to overcome previous October highs. Our 1st downtrend line serves as the first important obstacle since it represents a test of 9/21 highs and the concept of a more substantial near-term uptrend. As for the downside, the USD/JPY does have a few uptrend lines we can piece together and the psychological 90 level is now working the currency pair’s favor. However, the USD/JPY is still awfully close to critical levels and is not in the clear yet. We are in the midst of a debilitating downtrend, meaning the USD/JPY likely needs a violent reversal to break free of its funk. Gold is dipping after a failed retest of previous 2009 highs. Gold continues to follow the EUR/USD and AUD/USD play by play, so investors should keep an eye on the movements of these currency pairs. Meanwhile, the EUR/USD, GBP/USD and USD/JPY are all trading around their respective psychological levels. In fact, it appears the only technical obstacle separating the EUR/USD from extended gains is its psychological 1.50 level. Additionally, the S&P futures are battling 1100 while crude stares down $80/bbl. Hence, the markets are at a critical juncture, and gold is no exception. The precious metal is presently parked between previous 2009 highs and its own psychological $1500/oz level, not to mention $1075/oz and $1100/oz hanging overhead. Hence, gold has its work cut out for it to the topside. Gold’s near-term movements will likely depend the ability of the Euro, Aussie, and Pound to break out further against the Dollar. The Dollar is presently focusing on BoE Governor King’s upcoming public address along with the release of MPC Minutes and China’s big wave of econ data. The main catalyst will likely be the GDP and Industrial Production numbers from China. If these data points outperform as we suspect, investors may be encouraged to send the broad-based market beyond its present psychological barriers. However, as we explained in our GBP/USD analysis, Governor King may find this an opportune time to psychologically weaken the Pound in light of its recent appreciation by reiterating his dovish monetary stance. In all, we are still positive on gold trend-wise since the technicals are working in favor of the topside more than downside. However, markets can turn quickly and we are at a critical point, so investors should closely monitor the upcoming performance of gold and its correlations. Technically speaking, gold has topside barriers in the form of October highs along with the psychological $1075/oz and $1100/oz levels. 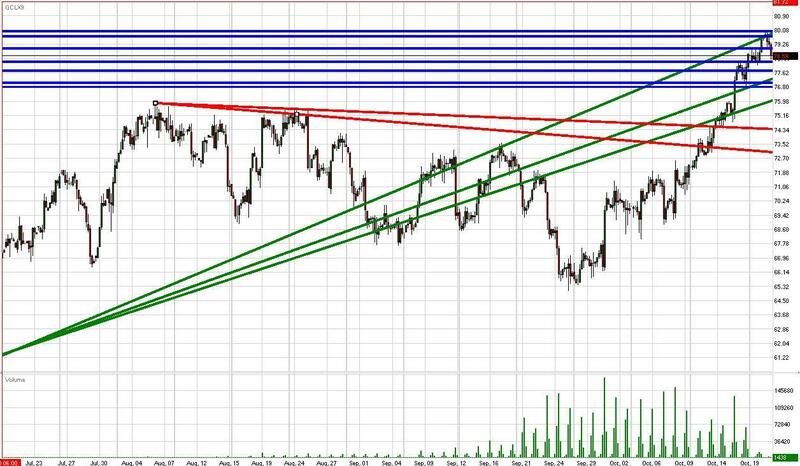 As for the downside, the precious metal has multiple uptrend lines serving as technical cushions along with 10/16 lows and the psychological $1050/oz level. The S&P futures are consolidating after taking a swipe at the psychological 1100 level in the wake up better than expected earnings from several U.S. bellweathers. As we’ve mentioned in our other commentaries today, the market at a whole is at a critical juncture with the EUR/USD trading around 1.50, the GBP/USD at 1.65, the USD/JPY at 90 and crude at $80/bbl. Not to mention gold is hovering between $1050/oz and all-time highs. Hence, the significance of the S&P’s test of 1100 is being reflected throughout the marketplace. Fortunately for bulls, the technicals in the S&P futures along with its correlations are working more in favor of the topside than the downside trend-wise. Therefore, it appears the S&P’s battle with 1100 will turn out favorably when all is said and done. Q3 earnings have been flowing in better than expected and America’s employment market finally seems to be leveling out. However, we continue to receive mixed signals in regards to overall economic fundamentals. Today’s PPI and Building Permits data printed worse than expected, adding onto Friday’s discouraging TIC and UoM numbers. Hence, consumer sentiment is still dragging and the influx of liquidity continues to fight deflationary forces. Therefore, the Fed has little leeway in tightening liquidity soon, particularly since unemployment is recovering at a snail’s pace. The Fed’s inability to act is a problem when foreign investors are losing interest in U.S. Treasures, as reflected by historically weak TIC data. Meanwhile, the ECB continues to pressure the Fed to act in favor of a stronger Dollar. Hence, the U.S. monetary system finds itself caught between a rock and a hard place. However, until either the Fed and BoE turn hawkish or the ECB dovish, it appears the Dollar will continue its downward trend. The Dollar’s weakness supports stronger U.S. equities and pricier crude, raising the longer term worries of inflation and the impact this would have should unemployment not register a considerable decline in the meantime. For the time being, investors will be focusing on BoE Governor King’s speech, MPC Meeting Minutes, and of course the wave of Chinese economic data late Wednesday EST. If China’s data meets or beats as we suspect, this could drive the S&P futures beyond 1100. However, any sign of a slowdown in China would undoubtedly deal a blow to global equity markets. We are also interested to see how EU PMI data prints on Friday. The S&P’s recent strength has been driven by a weak Dollar and investors shouldn’t forget that both the EU and Britain have shown signs of cooling. Any further cool down in econ data over the next week or two could shake confidence in the recovery and strengthen the Dollar. Technically speaking, the topside hurdles are clearly intraday highs and the psychological 1100 level. As for the downside, there are several uptrends we can form while the 1075 and 1050 levels serve as psychological cushions along with 10/19 and 10/9 lows. The S&P futures continue to set higher lows and this creates layers of support for the future. Meanwhile, investors should keep an eye on the interaction of the S&P’s correlations with their respective psychological levels. Any breakout in the EUR/USD, GBP/USD, crude and/or gold would likely signal a corresponding movement in U.S. equities. Crude futures continued their ascent and tested $80/bbl as expected. Crude futures have been energized by the combination of an improvement in unemployment, last week’s jolt in manufacturing data, and an impressive flow of Q3 earnings results. All three factors serve as positive catalysts in regards to the aggregate demand for and consumption of crude. Additionally, last week’s inventory data came in light of expectations. Hence, both the supply and expected demand factors of the equation are working in crude’s favor. However, the futures are presently experiencing profit taking after hitting $80/bbl in the wake of weak PPI and Building Permits data. Investor focus now turns BoE Governor King’s public address later today followed by MPC Meeting Minutes and key Chinese economic data tomorrow. These events should be markets movers and have a noticeable impact on the Dollar. Meanwhile, the S&P futures are battling their highly psychological 1100 level and the EUR/USD is dealing with 1.50. Additionally, the GBP/USD is approaching 1.65 and gold continues to trade between $1500/oz and 2009 highs. Hence, most of the major investment vehicles are facing psychological barriers, highlighting the significance of the moment. Fortunately for crude, the technicals of its correlations continue to support a weaker Dollar and an uptrend in equities and commodities. However, we all know how quickly markets can turn, so investors should keep a close eye not only on the behavior of crude, but its correlations as well considering the psychologicals markets are encountering. Technically speaking, we previously highlighted the importance of crude’s breakout above our top-tier downtrend line along with the psychological $75/bbl and August highs. Crude’s breakout follows two months of heavy consolidation, meaning the futures could be headed for more substantial gains over the near term. Of course, this will naturally depend on the performance of the Dollar and equities. We can’t form any noteworthy downtrend lines at the moment, meaning crude’s topside barriers are intraday highs along with $80/bbl and our new 3rd tier uptrend line. As for the downside, crude has several current and potential uptrend lines along with 10/19, 10/16, and 10/15 lows, $75/bbl and August highs.